Artist Union for exchange of information of information on union issues, moral rights, artist rights including artist fees, notifications of arts worker and artist activities between Australian states. Issues including discrimination against women, equal representation of genders, artist fees and artist contracts. Queensland members included Barbara Campbell, Ted Riggs, Brian Doherty, Ruth Propsting, John Waller, Penny Algar, Clare Williamson, Jeanelle Hurst, Russell Lake, Michelle Andringa and many others. 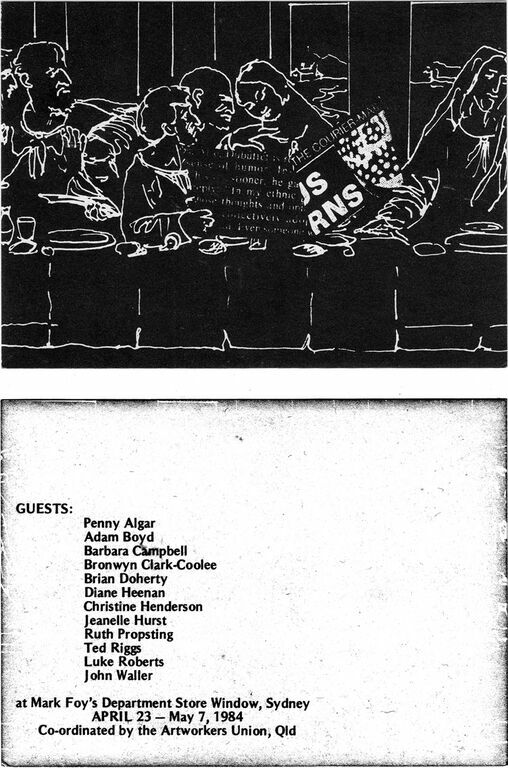 Artworker’s Union Queensland established in 1983-84 and in particular for negotiating artist fees, artist contracts for the 1985 Queensland Works exhibition at the University of Queensland curated by Nancy Underhill and Malcolm Enright. Artist rights, networking and information exchange. Formed in part in rQ members including artists Penny Algar, Adam Boyd, Barbara Campbell, Brian Doherty, Ted Riggs, John Waller, Ruth Propsting, Luke Roberts, Michelle Andringa, Clare Williamson and others.esponse to the Artworker’s Union (NSW).